Using the ALMA observatory in Chile, a group of astronomers led by MPIA's Henrik Beuther has made the most detailed observation yet of the way that a giant gas cloud fragments into dense cores, which then act as the birthplaces of stars. The astronomers found that the mechanisms for fragmentation are fairly straightforward, resulting from the combination of the cloud's pressure and gravity. More complex features, such as magnetic lines or turbulence, play a smaller role than previously thought. The scales of this fragmentation at multiple levels depend on the mechanisms involved. The simplest model can be written down using no more than high school physics: An ideal gas has a pressure that depends on its temperature and density. In a simplified gas cloud, assumed to have constant density, that pressure must be strong enough everywhere to balance the force of gravity (given by Newton's law of gravity) – even in the center of the cloud, where the inward gravitation-induced push of all the surrounding matter is strongest. Write this condition down, and you will find that any such constant-density cloud can only have a maximum size. If a cloud is larger than this maximum, which is called the Jeans length, the cloud will fragment and collapse. Is the fragmentation of young massive clusters really dominated by these comparatively straightforward processes? It doesn't need to be, and some astronomers have constructed much more complex scenarios, which include the influence of turbulent gas motion and magnetic field lines. These additional mechanisms change the conditions for cloud stability, and typically increase the scales of the different types of fragment. Beuther and his colleagues used ALMA to study the high-mass star-forming region G351.77-0.54 down to sub-core scales smaller than 50 astronomical units (in other words, less than 50 times the average distance between the Earth and the Sun). As Beuther says: "This is a prime example of how technology drives astronomical progress. We could not have obtained our results without the unprecedented spatial resolution and sensitivity of ALMA." Their results, together with earlier studies of the same cloud at larger scales, indicate that thermal gas physics is winning the day, even when it comes to very massive stars: Both the sizes of clumps within the cloud and, as the new observations show, of cores within the clumps and even of some core substructures are as predicted by Jeans length calculations, with no need for additional ingredients. Beuther comments: "In our case, the same physics provides a uniform description. Fragmentation from the largest to the smallest scales seems to be governed by the same physical processes." Simplicity is always a boon for scientific descriptions. 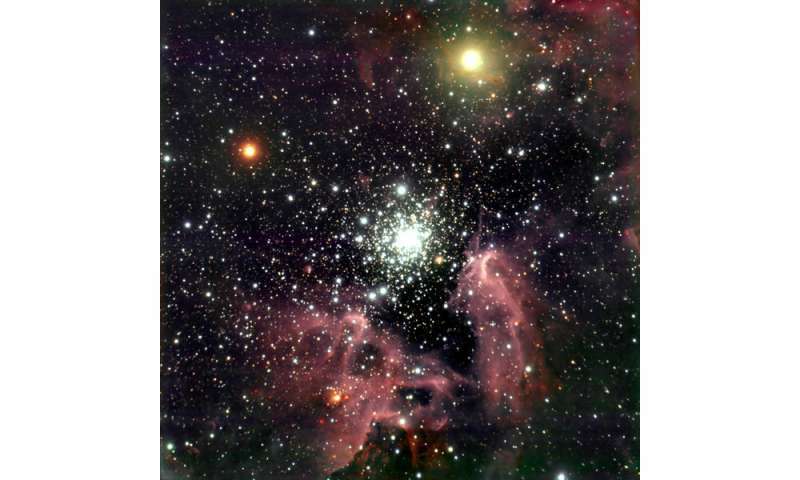 However, the same observations also provided a discovery that will keep astronomers on their collective toes. In addition to studying fragmentation, Beuther et al. had been looking to unravel the structure of nascent stars ("protostars") within the cloud. Astronomers expect such a protostar to be surrounded by a swirling disk of gas, called the accretion disk. From the inner disk of the rim, gas falls onto the growing star, increasing its mass. In addition, magnetic fields produced by the motion of ionized gas and the gas itself interact to produce tightly focused streams called jets, which shoot out some of the matter into space perpendicular to that disk. Submillimeter light from those regions carries tell-tale signs ("Doppler-broadening of spectral lines") of the motion of dust, which in turn traces the motion of gas. But where Beuther and his collaborators had hoped for a clear signature from an accretion disk, instead, he found mainly the signature of jets, cutting a comparatively smooth path through the surrounding gas. Evidently, the accretion disks are even smaller than astronomers had expected – a challenge for future observations at even greater spatial resolution. The plasma ignoramuses pontificate fanciful about collapsing gas clouds in the pathetic attempt to explain plasma physics. Needless to say, their models and guesses are meaningless tripe. Nope, they are backed by observation. On the other hand, you have no plasma physicists, and no model.